Sound simple? Well it’s not. The truth is that most business owners have no earthly idea how much their business is worth. And only a small percentage of those who think they know actually do. I know this is true because I’ve sold seven businesses during my career. Without market data, it’s very easy to come to the wrong conclusion about the value of your company. It’s only natural to think of the years you’ve put into building the company, the late nights, the dollars that you kept plowing back into the business even though you could have used a new car or a vacation. It certainly should be worth a lot of money. Or should it? When you get ready to sell, your best bet is to seek help from experts. A good mergers and acquisitions investment bank like Allegiance Capital Corporation can tell you what your company is worth by comparing it to others that were recently sold. Generally, your company will be valued at a certain multiple of its operating earnings, or what is often referred to as EBITDA (earnings before interest, taxes, depreciation and amortization). This multiple, which is set by the marketplace, is based on a host of factors such as the size of your company, your industry, your opportunity to grow and the talent level of your management. But regardless of whether the actual value of your business is a pleasant surprise or it’s a disappointment, you have to know what it’s worth, because potential buyers will. Once you know the facts, there are things you can do to make your business more valuable, in much the same way that you might spruce up your home before you list it for sale. What you can’t do is control the market. Buyers are either there or they’re not, which is why there’s no time like the present. Buyers are ready to buy now. They are flush with cash (as much as $3 trillion by some estimates). And they are looking for opportunities – perhaps opportunities like your company. At Allegiance Capital, we believe that the more entrepreneurs know about selling their businesses, the better off they’ll be. In fact, we view educating prospective clients as one of the most important things we do. We like to begin our process by offering a free book called Street-Smart Moves for Selling Your Business by Joe Aberger. 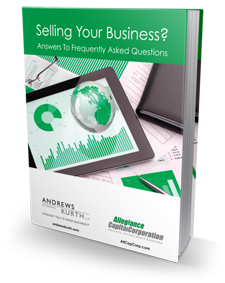 It’s brief, well-written, and addresses 29 topics that are critical to selling a business like yours. Just click on “About us” in the top navigation and then click the “Sign up Now” button on the right-hand side of the page. And, in the meantime, if you have questions, feel free to call us at 214.217.7750. Page Title: Do You Know How Much Your Business Is Worth?